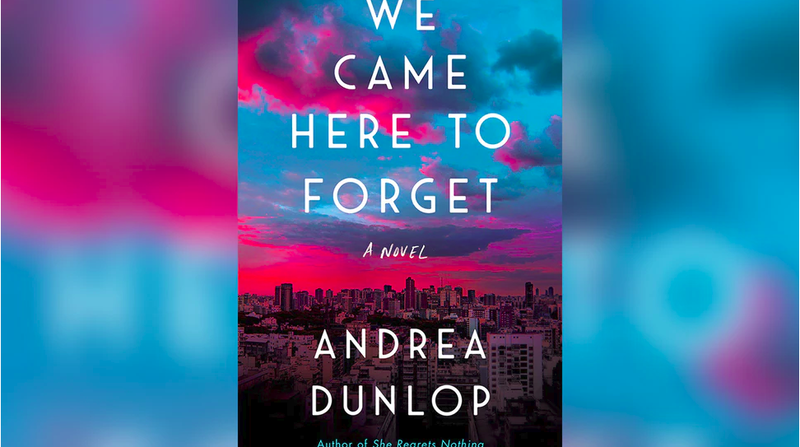 We Came Here to Forget, publishing July 2019, is the third novel from author Andrea Dunlop. Her previous novels, She Regrets Nothing and Losing the Light, are a slow simmer of sinister motives, with characters often driven by selfish desires and unforgiving flaws. We Came Here to Forget features Dunlop’s similar dark undertones, but with an important distinction: the characters, most of them anyway, know when they’re slipping into self-destructive territory, and beyond that, actually try and help save each other. But first, a quick synopsis: Katie Cleary has always known exactly what she wants: to be the best skier in the world. But as the upward trajectory of Katie’s elite skiing career nears its zenith, a terrifying truth about her sister becomes impossible to ignore—one that will lay ruin not only to Katie’s career but to her family and her relationship with Luke and Blair. With her life shattered and nothing left to lose, Katie flees to Buenos Aires. There, she reinvents herself as Liz Sullivan, and meets a colorful group of ex-pats, but can she really outrun her demons? Told in alternating chapters between past and present, the story opens in a documentary-like fashion. I’ve found that Dunlop’s style is removed in the beginning of the her books, where she describes the characters and their backgrounds in a factual way, which I think creates an ominous foreshadowing. Some people’s demons are so dark, you can’t get emotionally wrapped up, from fear that you too will be taken down by them. So as she sets the scene in this book, by introducing the players and teasing the tragedy that’s to come, your skin prickles. Your imagination runs wild. The lack of emotive language is a preview into a dark mind of the same. As the story builds, the writing becomes more involved—the language catching feelings, and the characters revealing their human elements. We watch as Katie becomes Liz, and how her desperate need to escape herself leads her to others doing the same. In the alternating chapters, pieces of the past slowly come together, and while I found myself guessing at the eventual horror during every chapter, it’s a slow coming together, with the picture not fully formed until the end. I loved this book. Taking the past first, there’s an addictive quality to the seemingly perfect family being shattered by something that feels both at once preventable and inevitable. These chapters are about denial, about self-obsession, about such severe focus that we miss crucial things unfolding around us. And they make you wonder whether or not Katie and her family could’ve stopped what happened many years before it was even a possibility. For me, I never questioned their guilt or complicity, but I did question their avoidance, and how it could’ve led to what happened. Being able to hold up both of these sides, to consider them as separate, speaks to Dunlop’s writing talent. Looking at the present, Liz (Katie) struggling to escape, to just find some relief for however long, is incredibly relatable. Who among us hasn’t dreamt about disappearing and starting over? And in this case, she meets a group of people all doing the same. A rarity in Dunlop’s novels, we’re introduced to a (mostly) supportive group of people (no dark motives against each other), and eventually learn the reasons for their being in Buenos Aires. I like to think of this as less about Katie/Liz finding herself again, but more about her realizing everyone has let something tragic define their lives, but whether or not it defines a moment, or the entirety, is a choice of resilience. The relationships explored with Luke, Blair, and Gianluca are representative of Katie’s/Liz’s stages in life, and they’re well thought-out in that way. From raw ambition, to unquestionable empathy, to pure escapism, the men here are load-bearing support to the woman’s journey. They reflect where she’s going, and without spoiling, I’ll say I love where she ends up. This book on the surface is addictive, each page a taste until you reach the “what” that’s been so slowly teased. Deeper, though, it’s also incredibly complex, making us question how blinded we become in the chase of our achievements, how family loyalty and trust is not a given, what it means to earn and give vulnerability, and how we manage to lose and find ourselves again and again throughout our lives. We Came Here to Forget is everything you’re looking for in a great book. And even in its darkest moments, when that reveal will make you sick to your stomach, as will its consequences, you’re reminded by Katie, and everyone around her, that resilience is part of the human condition. Be sure to follow all of my book reviews here on my blog, or if photos and short captions are more your thing, over on Instagram.